While that paragon of right-wing macho and bravado Ronald Wilson Reagan spent World War II on the backlot of a San Fernando Valley movie studio, George McGovern was killing Nazis while flying risky raids into Germany. You see, Ronnie was always an actor and always a coward. That is the essence of contemporary conservatism as evidenced by chicken hawks like Cheney, Limbaugh or Romney. McGovern a man horrified by war, because he actually experienced it was too modest and too unchauvinistic to make his service in WW II an inoculation against charges of pacifism due to his ardent opposition to the disastrous war in Vietnam. 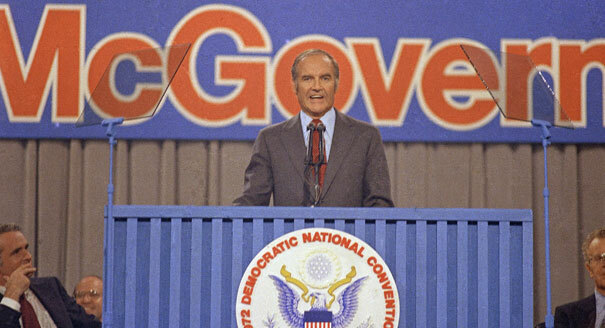 Many of my progressive elders cut their teeth in politics in the McGovern campaign of 1972. He was and is the most liberal/progressive major party candidate in the history of the United States. I was only 7 at the time, and was not on his side then but I always remember something beguiling about him, his name and the alternate devotion and antipathy he engendered. One Bright Shining Moment (2005) Stephen Vittorio's magnificent documentary on McGovern captures the highlights of the '72 campaign. 1972 was still the 60s and it wasn't until Nixon's resignation in disgrace in 1974 did that wild ride from 1963 to 1974 end. The McGovern campain of 1972 was innovative and novel in so many ways--from reforming the Democratic Party to organizing in the Iowa caucuses, and pioneering a direct mail donor base of small contributors among other things. 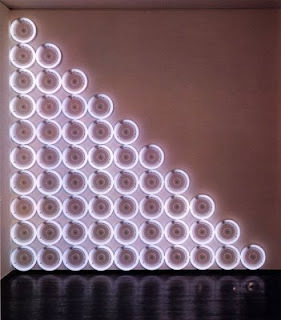 But one overlooked aspect of the campaign was the enlistment of the creative community. It wasn't just Shirley MacLaine, Warren Beatty, Gloria Steinhem and the rest. 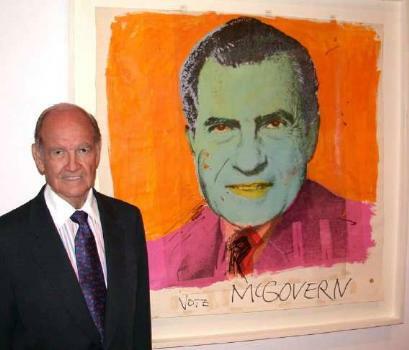 The leading contemporary artists of the day were onboard from Warhol to Flavin and both created iconic works for the campaign with Warhol's wickedly cutting "Vote McGovern" silkscreen featuring a scary looking Richard Nixon among the finest political works of the past half century. I had the good fortune of speaking to McGovern in the '90s and I asked him a question he graciously called a great question that not many people had asked him before. My question was why he didn't run for president in 1976 after having been vindicated by the debacle of Nixon's second term? He answered that he considered it and had wanted to do it himself and regrets not having tried, but that he couldn't muster much enthusiasm from his family and close supporters. Many try to imagine the world if McGovern had won in 1972, but then we probably don't get the full story of Watergate and the disgraceful Indochina exits would have happened on his watch. But a President McGovern in January 1977 would have been a fascinating prospect indeed.